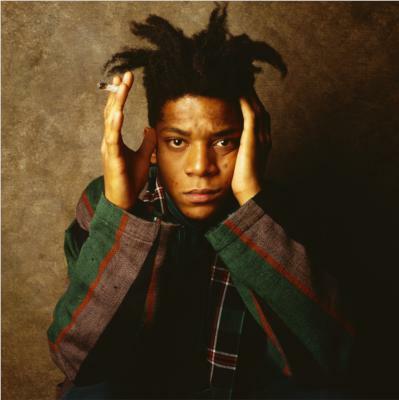 In his short life, Jean-Michel Basquiat was a pop icon, cultural figure, graffiti artist, musician, and neo-expressionist painter. He was a precocious child, and by the age of four he could both read and write. By the time he was eleven, he was fluent in English, French, and Spanish. And by the time was fifteen, he ran away from home, living for less than a week in Washington Square Park, after which he was arrested and sent back home to live with his father. He dropped out of school in tenth grade, after which his father kicked him out of the house, leaving the young artist to live with friends, supporting himself by selling T-shirts and homemade postcards. 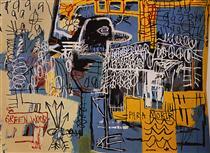 In the 1970’s Basquiat began spray painting buildings in Lower Manhattan, using the pseudonym SAMO, earning him notoriety and a certain amount of fame. He appeared on television in 1979 on the sow “TV Party,” and that same year formed a rock band called “Gray,” which performed all throughout New York. During this time, he also appeared in the music video “Rapture” by Blondie. By 1982, he was regularly showing his work, and had many high-profile friend ships, including a brief relationship with Madonna, a brief involvement with the musician David Bowie, and a long-time collaboration with the artist Andy Warhol. 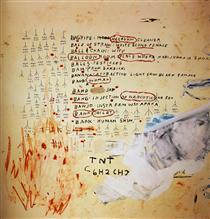 He worked on his paintings in $1,000 dollar Armani suits, in which he would appear in public, spattered in paint. He also appeared on the cover of New York Times Magazine in 1986. 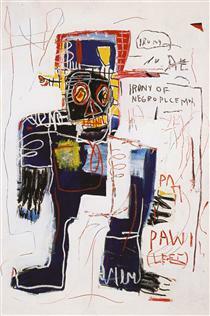 Although he was a successful artist, Basquiat became addicted to heroin, and after the death of his friend Andy Warhol in 1987, his addiction became worse. Be became increasingly isolated, and died of a heroin overdose in 1988.Posthumously, many exhibitions of his works have been held, and biopics, books, collections of poems and feature films have all been inspired by his work and life. 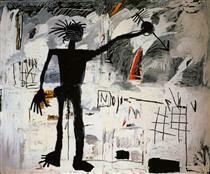 Jean-Michel Basquiat (French: [ʒɑ̃ miʃɛl baskija]; December 22, 1960 – August 12, 1988) was an American artist. 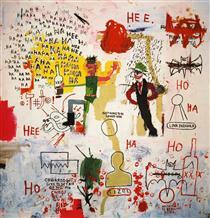 Basquiat first achieved fame as part of SAMO, an informal graffiti duo who wrote enigmatic epigrams in the cultural hotbed of the Lower East Side of Manhattan during the late 1970s where the hip hop, punk, and street art movements had coalesced. 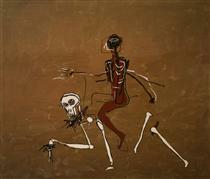 By the 1980s, he was exhibiting his neo-expressionist paintings in galleries and museums internationally. 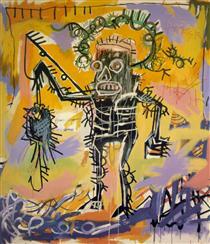 The Whitney Museum of American Art held a retrospective of his art in 1992. 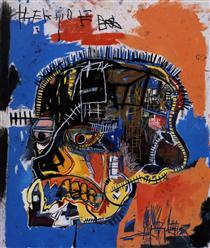 On May 18, 2017, at a Sotheby's auction, Basquiat's 1982 painting, also Untitled, created with oil stick and spray paint and depicting a skull, set a new record high for any U.S. artist at auction, selling for $110,500,000. Jean-Michel Basquiat was born in Brooklyn, New York, on December 22, 1960, shortly after the death of his elder brother, Max. 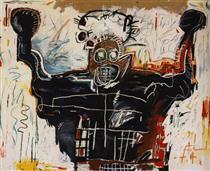 He was the second of four children of Matilde Andrades (July 28, 1934 – November 17, 2008) and Gérard Basquiat (1930 – July 7, 2013). He had two younger sisters: Lisane, born in 1964, and Jeanine, born in 1967. 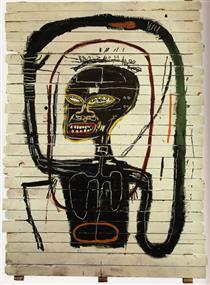 His father, Gérard Basquiat, was born in Port-au-Prince, Haiti, and his mother, Matilde Basquiat, who was of Puerto Rican descent, was born in Brooklyn, New York. Matilde instilled a love for art in her young son by taking him to art museums in Manhattan and enrolling him as a junior member of the Brooklyn Museum of Art. 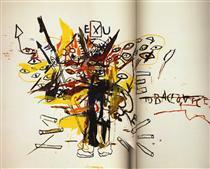 Basquiat was a precocious child who learned how to read and write by age four and was a gifted artist. His teachers, such as artist Jose Machado, noticed his artistic abilities, and his mother encouraged her son's artistic talent. 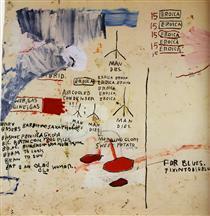 By the age of 11, Basquiat was fully fluent in French, Spanish and English. 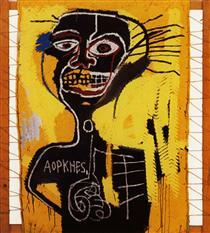 In 1967, Basquiat started attending Saint Ann's, an arts-oriented exclusive private school. 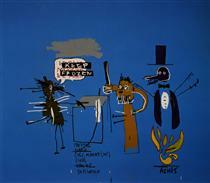 He drew with Marc Prozzo, a friend from St. Ann's; they together created a children's book, written by Basquiat and illustrated by Prozzo. 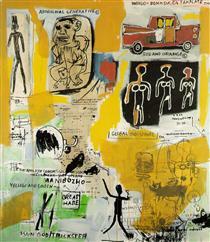 Basquiat became an avid reader of Spanish, French, and English texts and a more than competent athlete, competing in track events. 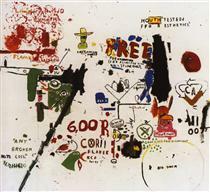 In September 1968, at the age of seven, Basquiat was hit by a car while playing in the street. His arm was broken and he suffered several internal injuries, and he eventually underwent a splenectomy. While he was recuperating from his injuries, his mother brought him the Gray's Anatomy book to keep him occupied. This book would prove to be influential in his future artistic outlook. His parents separated that year and he and his sisters were raised by their father. The family resided in Boerum Hill, Brooklyn, for five years, then moved to San Juan, Puerto Rico in 1974. After two years, they returned to New York City.